Trenton, NJ– The New Jersey state Assembly Budget committee approved assembly bill A4225, also known as the Tuition Equality Act, after New Jersey DREAM Act Coalition, New Jersey United Students, Anakbayan New Jersey and more than a hundred dreamers, community and labor supporters packed the hearing this past Monday in Trenton. Assembly bill no. 4225 or the Tuition Equality Act, was introduced by Assemblyman Gordon Johnson. The bill will allow undocumented students who have attended New Jersey high schools for a minimum of three years to qualify for in-state tuition rates in New Jersey’s public colleges and universities, on the condition that they have earned a diploma or GED from a NJ high school, and sign an affidavit promising to adjust their immigration status if given the opportunity to do so. More than 20 people, including DREAMers and community leaders, testified in support of the Tuition Equality Act during the committee hearing. Speakers shared personal stories, and presented economic and moral platforms that garnered praises from assembly members. “In New Jersey we already invest over $200,000 in educating our DREAMers from elementary school through high school. That is an investment that New Jersey, through its Out of State tuition policy, effectively kicks out to neighboring states such as New York, where tuition would be cheaper. We then stand to lose all their tax dollars, expertise, and investments that would otherwise be put into New Jersey.” Tello continued. Around 3:00pm, many at the assembly hearing erupted into cheers and applause when the committee members voted 8 out of 12 in favor of the bill. Following the Assembly budget committee vote, the coalition held a press conference to celebrate this important step and to call on the Senate to bring the bill up for a committee and floor vote. “A4225 is only controversial to those who are not familiar with the undocumented student community’s moral and economic argument,” says Kamika Bennett, a student at Essex County College and member of the Essex County Dream Team. “I ask the General Assembly to post and pass A4225. I ask the Senate to post and pass the equivalent of A4225 now. We will work for as long as it takes to win tuition equality so that all students can access higher education in New Jersey,” Bennett concluded. With overwhelming community support statewide, campaign organizers are confident the bill has the votes to pass in both the General Assembly as well as the Senate. Student and youth leaders say they are also confident Governor Christie will choose to make this investment in New Jersey’s future when the bill reaches his desk. 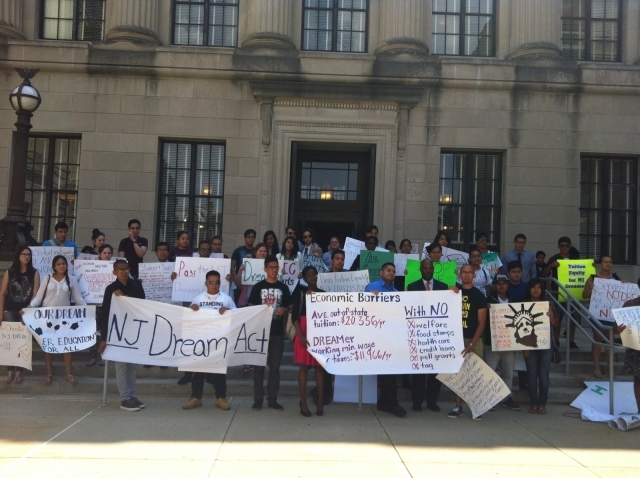 Five months ago the youth and student coalition led by New Jersey United Students, the New Jersey Dream Act Coalition, and Anakbayan NJ gathered at the steps of the State House to announce the launch of New Jersey DREAM Act Campaign. Since then, they have continuously gained a growing number of supporters. There are over 70 student, community, labor and faith-based organizations that have signed on letters of support. Five City Councils, and two Counties have passed resolutions urging NJ State legislators to pass in-state tuition for DREAMers. Most recently, the New Jersey Presidents’ Council, representing all public and private 2-and-4-year colleges and universities in the state, and the New Jersey Council of Community Colleges passed resolutions in support of In-State Tuition for undocumented youth.